In stock -This product will ship today if ordered within the next 2 hours and 6 minutes. Clearspring`s high quality brown rice miso, a fermented Japanese soya paste, is carefully made to a traditional recipe and aged in cedarwood kegs. Use to make an authentic Japanese miso soup as well as to season and enrich the flavour of soups, stews, beans, sauce and dips. Clearspring offer a great range of organic and premium quality Japanese and European foods skilfully prepared by artisan and professional producers. Each Clearspring product has a distinct flavour and quality that comes from using the finest quality ingredients and respecting local food traditions. One teaspoon of miso seasons about one cup of liquid. Dissolve in a little cooking liquid then add towards the end of cooking. Avoid boiling to preserve the friendly bacteria in unpasteurised miso. Refrigerate after opening and consume within 6 months. 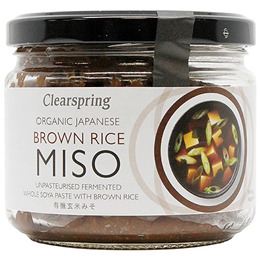 Below are reviews of Clearspring Organic Brown Rice Miso - 300g by bodykind customers. If you have tried this product we'd love to hear what you think so please leave a review.